Following Manchester United’s 2-0 win over Huddersfield Town in the FA Cup on Saturday, manager Jose Mourinho confirmed that the club will be looking to bring in a midfielder in the upcoming summer transfer window. “We need to sign a midfield player,” the Portuguese tactician was quoted as saying after the full-time whislte. “Because we are going to lose Michael Carrick. Of course, we need balance in the team. “Some of you [the media] keep saying that we are going to buy that striker, that winger, that left winger, that right winger. You can accuse me of many things, but you cannot say that I lied to you. And as per The Independent, the midfielder on the top of Mourinho’s wish-list is none other than Real Madrid superstar Toni Kroos. The Red Devils have been linked with the German international numerous times in the past, during the reigns of former managers David Moyes as well as Louis van Gaal. WATCH: 5 Reasons Why Real Madrid Can Win The Champions League AGAIN! 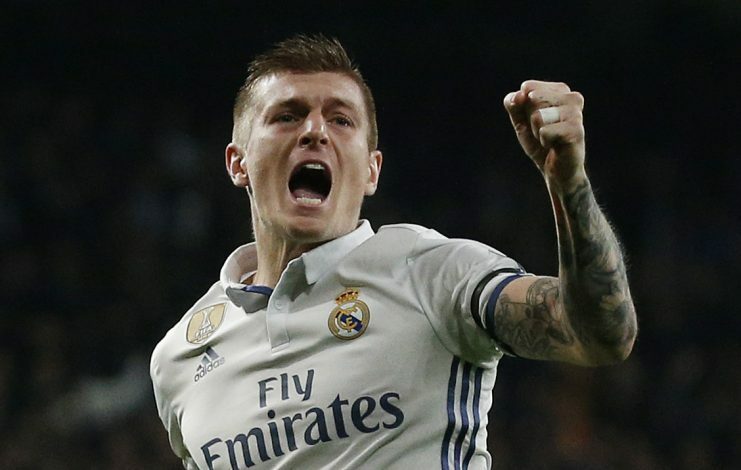 However, with recent reports in Spain claiming Los Blancos are planning a major squad overhaul this summer in order to bring in a new club talisman, Kroos could finally make his way to the Theatre of Dreams at the end of the season. The former Bayern Munich man is one of the best holding passers of the ball in the world – precisely the type of midfielder Mourinho needs alongside his preferred duo of Paul Pogba and Nemanja Matic in the middle of the park. The report does add that in case Manchester United fail to sign the 28-year-old, they will then turn their attention towards Borussia Dortmund starlet Julian Weigl.